Correct me if I’m wrong, but Châteauneuf du Pape doesn’t seem to be a very fashionable wine these days. I don’t know why that is: Name too long? Wine thought to be too big? Too rough? Made with the wrong grapes for current trends? All of the above? Whatever the reasons, it’s a shame, because Châteauneuf is, and has been for a long time, a reliably elegant wine, capable of aging long and gracefully, and wonderfully adaptable with food of all sorts. I have always loved Châteauneuf du Pape for both those qualities: Many decades ago it was a 15-year-old bottle of Château Fortia that first taught me about the glories of sun-toasted southern wines. This was all brought back to me forcefully about two weeks ago, when Diane indulged ourselves and some friends in a dinner of marcassin, braised young boar, for which occasion I dug out of the deep recesses of my ancient baronial cellar two bottles of 1998 Domaine de la Solitude. Domaine de la Solitude has suffered its vicissitudes. One of the most historic estates in the whole appellation, it has been continuously producing wine since the beginning of the 17th century, and was actually one of the first estates in France to bottle its own wine, before even Lafite, though neither it nor its zone has ever acquired the prestige of the Bordeaux estates. The whole area of southeastern France was among the earliest to be cursed with the plague of phylloxera, which devastated the local economy and from which it only slowly recovered. For many years, Châteauneuf and neighboring areas were thought of as producing only rough country wines, most of which were consumed locally or shipped north to Burgundy to give some heft to the often pusillanimous red wines of that region. The practice was so common, that hermitagiser became a widespread euphemism for it (and also palliated the adulteration of those wines with less honorific liquors). 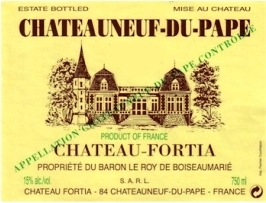 Things began to change for Châteauneuf du Pape during the 1920s, when the almost legendary Baron Le Roy de Boiseaumarié of Château Fortia organized many local vignerons to protect the integrity of their wines – and, not coincidentally, to command more respect and a commensurately better price for them. 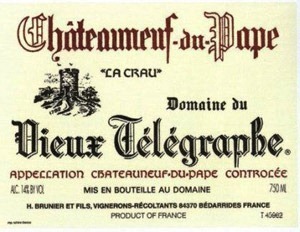 The group drew up a list of regulations for Châteauneuf du Pape that later became the model for all of France’s subsequent AOC legislation. 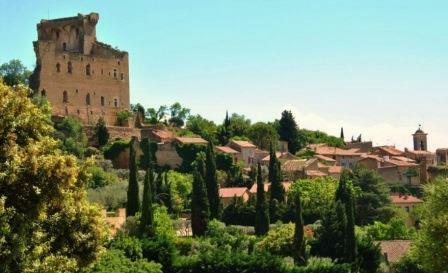 With some small modifications, those regulations still govern the making of Châteauneuf du Pape. Thirteen grape varieties are permitted in the blend. These include Mourvèdre and Syrah, as well as lesser known varieties such as Picpoul, Cinsault, and Counoise; but far and away the most important grape is Grenache, which in the opinion of many achieves its greatest heights in Châteauneuf. Grenache has at times constituted almost 90% of the blend from some estates. More usual is something in the neighborhood of 60%; anything as low as 40% is uncommon, but it does occur. Domaine de la Solitude’s blend has tended to run around 60% Grenache, with the balance being Mourvèdre and Syrah and a small amount of Cinsault. At the wild boar dinner that triggered this mental excursion to southern France, we opened two bottles of 17-year-old Domaine de la Solitude about two or three hours before serving them. While both were thoroughly enjoyable, the marked differences between the two provided a vivid lesson about bottle variation in older wines. The first bottle we poured had one of the loveliest aromas I’ve encountered in any wine: fresh, with distinct floral notes intermingled with wild berries and forest underbrush, the whole package delicate and persistent – so much so that several of us spent a long time just sniffing before we ever got around to tasting. When we did, the wine on the palate was not as ethereal as the wine on the nose. It tasted rounder and more robust than the aroma suggested, less nuanced – though to preserve my reputation with our guests, it interacted very well indeed with the richness and savoriness of the boar. The second bottle lacked the magical aromas of the first: It was more straightforward and more mature-smelling. Nevertheless, on the palate it seemed slightly fresher and a little bigger than the first bottle, and it too matched quite comfortably with the last tastes of boar and the first tastes of the cheeses that followed. The differences between the two bottles and how one could possibly account for them also provided food for a good deal of (fairly farfetched) speculation and amusement. 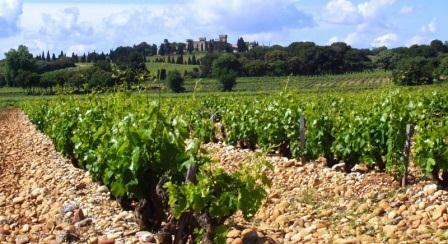 That, of course, is one of the great charms not just of Châteauneuf du Pape, but any good wine. Wine season in New York began right after Labor Day with the proverbial bang, conglomerating more wine lunches, portfolio tastings, verticals, and horizontals in the past few weeks than any single liver could deal with. Here are a highly selected few of the season’s stand-out new release wines from a few of those events. Champagne is always a good opener. Two beauties here: Ayala, which deserves to be as well known here as it is in Europe, is brought in by the small import firm Cognac One. Pol Roger, which is well known everywhere, is imported by the large firm Frederick Wildman. Ayala is probably the smallest of the Grandes Marques, even though it was a founding member (1882) of that association. Owned since 2005 by Bollinger, Ayala has had the same cellar master (Nicolas Klym) for 25 years. Ayala regards itself as an artisan house, working with highly selected vineyards and grapes: There is quite a lot of grand cru Pinot noir in its basic Brut Majeur and Vintage Brut. I thought the Brut Majeur NV quite stylish and enjoyable, with the merest trace of sweetness in the finish. Drinkers less sensitive to sugar than I will not notice it at all. For total sugar-phobes, Ayala’s Brut Nature NV is the wine of choice: Sound, clean, and fully dry, with a lovely wheaty/toasty palatal presence, this wine would serve both as aperitif and dinner companion. The Blanc de Blancs 2004 is vinified entirely from grand cru Chardonnay to make a lean and muscular wine, with ample fruit for enjoyable drinking. Cuvée Perle d’Ayala Nature 2002 is composed of 80% Chardonnay and 20% Pinot noir from grand and premier cru villages. It has a fine wheaty nose, excellent body and full, mouth-filling flavor, with a very long finish. Ayala’s top-of-the-line Brut Millesimé 1999 reverses the blend – 80% Pinot noir and 20% Chardonnay – to make a lovely wine, elegant and balanced, deep and long-lasting. Very fine indeed. Pol Roger is one of the best-known names in Champagne. The house is justly famous for quality throughout its line and for its maintenance of the distinctive fresh and full style that made it Winston Churchill’s favorite. Pol Roger “Pure” Brut Nature NV, Brut Réserve “White Foil” NV, Blanc de Blancs 2002, Vintage Brut 2002, and Brut Rosé 2004 are all cut from the same fine cloth: biggish wines that manage to be rich and austere at the same time, so that you don’t know whether to admire more the depth of their flavor or the restraint of their style. The Cuvée Sir Winston Churchill 1999, named after the house’s most famous and most loyal client, is simply gorgeous – as usual. Perhaps the most astonishing thing about the Grands Marques houses is the way they preserve such a very high level of quality year in and year out. They make it look routine, but there is nothing easy about it. I was also impressed by multiple wines from another Wildman producer, Paul Jaboulet Ainé. This Rhône master makes the whole gamut of northern and southern Rhône wines well, from its basic Parallèle 45 red and white up to some very rarified heights. I found its two red Hermitages, 2009 La Petite Chapelle and 2005 La Chapelle, very striking, the former very floral and – at this stage of its development – a bit rustic, the latter still half-closed but elegant and polished and structured for the ages. I loved Jaboulet’s Cornas Domaine Saint Pierre (2009), which was huge and utterly characteristic of Cornas – the northernmost outpost of Syrah in the Rhône, and an appellation that rarely gets the respect it deserves. Its wines are typically forceful, even aggressive in their youth, but mellow as they age into deep and polished, always identifiably southern, wines. They can age as long as any other Rhône appellation. Much as I liked the Jaboulet reds, however, the two wines that really enchanted me were the firm’s 2010 Châteauneuf du Pape Les Cèdres blanc and 2007 Hermitage Chevalier de Sterimberg, the latter already an extremely lovely white wine, but one that will live and slowly improve for decades. Should I live so long, I would drink this wine when it’s 20 years old. Back at the Cognac One tasting, another Rhône producer caught my attention: Cave de Tain. This is a co-op, and an excellent one. Headquartered right at Hermitage, Cave de Tain draws upon growers who produce more than half of all the northern Rhône AOC wines made. Its basic 2010 Syrah is a beautifully restrained example of the variety, while its red 2009 Crozes Hermitage, also 100% Syrah, shows the same restraint coupled with an excellent acidity and minerality, with fine potential for intermediate aging. 2006 Saint-Joseph and 2005 Cornas, both, again, 100% Syrah, are already deep and showing complexity despite their relative youth. Both will age well for at least ten years. Neither appellation, it seems to me, gets sufficient attention from serious wine lovers. The top of Cave de Tain’s range contains a lovely 2005 Hermitage rouge (nose of chestnuts and earth, deep palate, smooth and fresh), a 2010 Esprit de Granit Saint-Joseph (mineral and black pepper nose, deep peppery Syrah finish: needs years), and an absolutely gorgeous 2005 Gambert de Loche Hermitage (already deep and velvety; still evolving and deepening). These are all first-rate examples of Northern Rhône character. Finally, one Italian producer (you knew I couldn’t resist): Aurelio Settimo of La Morra, one of the key communes of the Barolo zone. Tiziana Settimo, daughter of the eponymous founder and guiding spirit of the small estate for a decade now, hosted a lovely dinner at Porter House restaurant to celebrate her wines’ re-entry into the US market. Her new importer for New York and New Jersey is Verity Wine Partners. She showed the first four wines to arrive here: Dolcetto d’Alba 2010, Langhe Nebbiolo 2006, Barolo 2007, and Barolo Rocche dell’Annunziata 2007. All four wines showed the characteristic Aurelio Settimo elegance and restraint, coupled with – especially in the case of the two Barolos – intensity of flavor and the absolutely classic spectrum of Nebbiolo components. 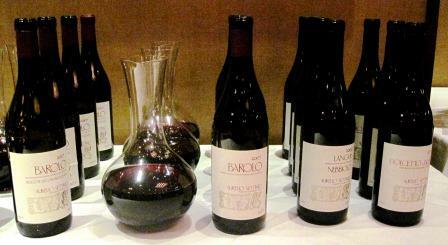 The Nebbiolo d’Alba, although slightly lighter-bodied than the two Barolos, showed the same purity of Nebbiolo character. This is a totally pleasurable wine, ready to drink now (it loved a porcini and black truffle risotto) and likely to hold at a fine level for at least five years yet. At about half the price of the Barolos, it represents the closest you’re going to come to a steal in Alba wines these days. 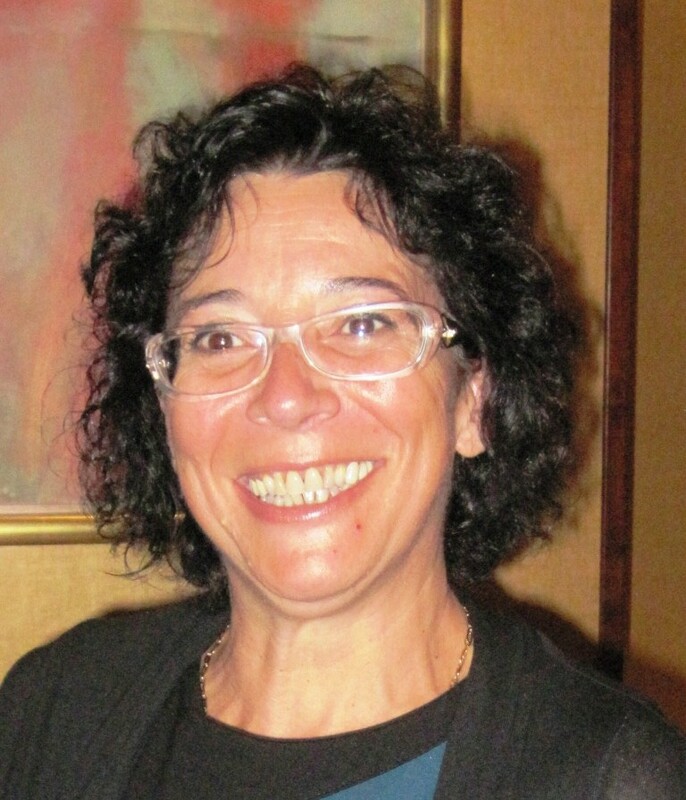 The commune of La Morra has been pretty much setting the pace for Barolo for a few years now, and meticulous, painstaking winemakers like Tiziana are the reason why. That’s all for now: there will be more reports on outstanding wines as the season wears on. Coraggio! If you listed France’s great red wines in order of prestige, Châteauneuf du Pape would probably come in last. It is unquestionably a great wine, and it’s long been one of my favorites, but it just doesn’t get much respect. From the canny consumer’s point of view, that’s great: It keeps the prices from soaring into the stratosphere with Bordeaux and Burgundy and the two darlings of the south, Hermitage and Côte Rôtie. But from the point of view of justice, it’s irksome: Châteauneuf deserves better. This little effusion was prompted by a lovely bottle of ’98 Vieux Télégraphe La Crau that Diane and I broke out a few nights ago to accompany a broiled butterflied leg of lamb and some fresh chanterelles. Yes, it’s that time of year: The summer-fruiting chanterelles are in, the temperature is high, and the cooking is simple. But simple cooking doesn’t mean you have to drink lesser wines; a grilled leg of lamb will partner happily with the best reds in whatever passes for your cellar. Ergo, the Vieux Télégraphe. As fine wines will, this one prompted not just that fit of indignation on its behalf but also a bit of nostalgia that led in turn to reminiscences of its kin and to memories of my long involvement with Châteauneuf du Pape. Like almost everyone of my generation, I learned wine on French wine – and for too long a time, that meant Bordeaux and Burgundy almost exclusively. There was so much to know there, and so much to enjoy, that I was slow to move out to other parts of France and the world. At about the same time I was learning that there’s more to Italy than simple Chianti and Soave Bolla, I began to discover the south of France, and especially Châteauneuf du Pape, which in those dark days was one of the few wines from anywhere along the Rhône that found its way to the US. It was probably a Château Fortia that started my love affair with Châteauneuf. 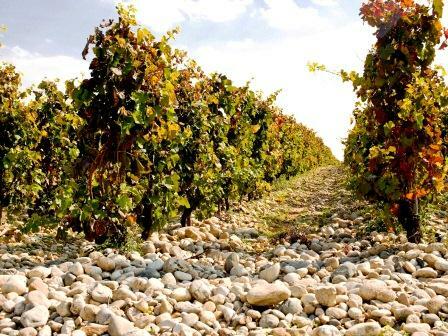 Memory tells me that Fortia was one of the most readily available Châteauneufs then, and one of the most important estates in France because of its proprietor’s major role in the creation of the whole French wine appellation system. 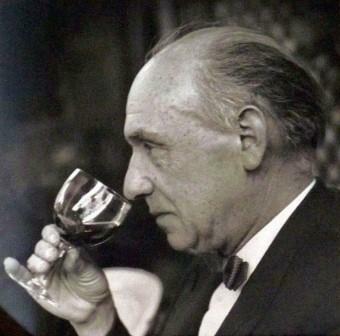 Baron Le Roy Boiseaumairié, a Norman and a WWI fighter pilot who married into the Rhône estate, led the local fight against fraudulent wine (some things are always with us) and formed a consortium that formulated the basic rules for what goes into Châteauneuf and how it’s vinified. Later, he led the national commission that established similar regulations for France’s other wine zones. And all the while, he continued to make excellent wine at Château Fortia. Forty or more years ago, that wine tasted of summer to me – sunbaked, in a totally attractive, travel-poster way: dark and vinous, with a hint of raisins and a deep plums-turning-into-prunes flavor that seemed to demand strong meats and stinky cheeses – which, I quickly found out, Châteauneuf responded to as to long-lost friends. How could you not like this wine? Everything about it was redolent of where it came from. Just smelling it conjured up images of tanned, gnarled farmers under a brilliant clear sky tending equally gnarled vines on rocky, arid fields. So strong was the impression that I resolved to go as soon as possible and see for myself. I don’t know now whether I really envisaged all that before I actually got to the Rhône valley, or whether the rocks and sun that I saw when I arrived seemed so right that I persuaded myself I had foreseen it. It really doesn’t matter. The sun-dazzling, almost cobbled vineyards of Châteauneuf du Pape looked to my mind exactly like what the wine tasted like: Here was gout de terroir as concentrated and true as any wine lover could wish. In those days of yore, there was, alas, a large downside to that wonderful sunscape. Very few hotels in southern France had air conditioning, and the few that did were very reluctant to turn it on (“It is not yet the season, M’sieur”). I remember a ghastly night in Avignon when, forced to leave the windows open because of the heat, our room was invaded by the vampires of the Rhône, mosquitoes as big as WWII fighter planes and guided, I firmly believed, by the vengeful souls of downed Luftwaffe pilots. I grew up near the New Jersey meadows (not then The Meadowlands), and I know from mosquitoes. When Diane and I went down to breakfast next morning, having donated as much blood as the insect hordes could carry, we looked like plague victims, dotted with buboes and swellings. We had to drink a lot of Châteauneuf that week to rebuild our blood supply. Happily, the mosquitoes were not the only ones who dined well in Avignon. There were several very fine restaurants there, and the cuisine was still classique. One in particular, Hiély Lucullus, stands out in memory both for superb food and for allowing me to say one of the few clever things I’ve ever managed in French. If the cuisine was still classique, and so were the attitudes. Consequently, not a person in France could be persuaded to understand a single syllable that came from my mouth. And since no one then would deign to understand English, Diane, whose French is good, usually spoke for us. 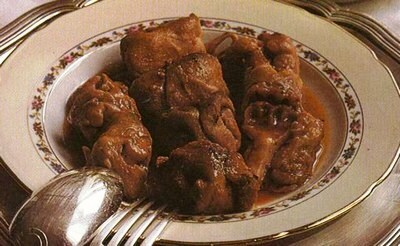 But at Hiély, I attempted to order for myself, and what I ordered was Pieds et Paquets, a lamb knuckle accompanied by a neat little package of lamb tripes. The waitress was extremely dubious, and asked me – in French of course – if I knew what I had asked for. I replied, in the very best French I could muster, that although I spoke French very badly, I ate French very well. She was dumbfounded – clearly, this possibility had never occurred to her (nor, to be just, to anyone else in France at that time). She gave us very attentive service for the rest of the evening – which by way, contained another fine bottle of Châteauneuf. Much has changed in France since then: cuisine, attitudes, and wines. There are now more producers of fine Châteauneuf than ever, and most of the wine is better made – more consistent from harvest to harvest, more elegant, less rustic: more modern I guess you’d say (though that’s not always a good thing). Except for one or two superstar producers (you won’t find their names here), Châteauneuf is still reasonably priced, still rewards aging, and still tastes deeply of the South. Maybe it’s not as raisiny anymore, but it still sincerely loves strong meats (especially long-stewed ones) and stinky cheeses, and its generous bosom happily makes room too for a nice piece of broiled lamb. Just don’t forget the chanterelles, if you can get them. Nostalgia is all well and good, but mushrooms are of the moment. I’ve been doing a lot of wine travel lately, all of it in Italy. In mid-February I was trekking through an unexpectedly snowy and cold Tuscany, and in fact I’m in Italy right now. I wrote this post ahead of time and scheduled it to appear during the week when I’m off to hopefully warmer Sicily, followed by a few days in Piedmont. That adds up to a lot of Italian wines, mostly red and mostly very young. You’ll hear about all these eventually, but I need a little time to get some distance on them and think about them. In between trips, while I was home, I wanted to drink some wines that were neither Italian nor young, so I went scrounging in that “cellar” (i.e., closet) you’ve heard so much about recently. Here’s what I dug out. The white wines of the Rhone Valley are generally not well known in this country, which is OK by me, since there isn’t a huge supply of them and they’re expensive enough already. Although they can be drunk young – they’ve all got good fruit, sound structure, and usually intense minerality – they are supremely age-worthy wines. At seven years of age, this archetypically Rhone blend – 80% Rousanne, with Grenache blanc, Picardan, Bourboulenc, and Clairette – was still very youthful, despite its appearance. It was the color of copper, and had a scent of copper too – definitely something metallic – plus dried pear and fig and any number of other things that popped up as it opened and changed with food. White Chateauneufs and their cousins, the white Hermitages, are big wines, with a take-no-prisoners attitude: you have to come to them. This one loved our appetizer of smoked sturgeon, but it really wanted roast turkey or pork or veal rather than the skate meuniere we had prepared for a main course. Unquestionably a great, distinctive wine, and a fine representative of the whole august family. I have only a few more bottles, which I’ll try not to drink before their tenth birthday at least. Wish me luck. As should be clear to anyone who’s following this blog, I am not a huge fan of the dominant California style in wines – all that big, forward fruit and high alcohol – but Beaulieu Vineyards has never been a member of that school. It has always been one of the more European-style winemakers, emphasizing balance and elegance rather than power: diplomacy rather than a frontal assault. This ten-year-old bottle of its flagship wine didn’t disappoint in any way. As expected, it showed itself balanced and elegant rather than forceful, though the nose is big and rich. Initially, some bitey green tannins appeared in the finish, but braised lamb shanks nicely smothered that and brought up the wine’s body and finesse. Green tannins don’t go away with bottle age – if they’re present in the grapes at harvest, they last in the bottle forever – but some foods can deal with them. 1998 must have been hot, with a lot of sugar ripeness to force harvest before the tannins completely ripened and softened – a frequent problem in California, which most producers use a lot of new oak to hide. I’m sure this wine saw some barrique, but not enough to alter its fundamentally sound flavors. A really nice wine, enjoyable and thought-provoking. Ridge is another one of the California producers I trust. When push comes to shove, I’ll taste anything Paul Draper makes, and the odds are strong I’ll like it. He has a markedly European palate, and the wines he makes tend to reflect his predilection for balance, elegance, and depth. I love his Zinfandels because they become so claret-like as they age: they just seem to go from harmony to harmony, year by year. This ten-year-old was just perfect, and unfortunately my last. 68% Zinfandel, 16% Carignane, 16% Petite Sirah. Sonoma County. 14.8% alcohol. Bottled January 2001. Despite the season’s late start, moderate temperatures and a long, lovely autumn fully matured the fruit at Geyserville; harvest began in the last days of September. The old zinfandel (c. 1900) was picked first, then the young vines, planted in 1990. We waited until mid-October for the forty-year-old zinfandel and one-hundred and twenty-year-old carignane, finishing with petite sirah. Each of the eighteen parcels was held separate; naturally occurring yeast and natural malolactic bacteria carried out the fermentations. Twenty-five percent of the wine was aged in new, air-dried american oak, the rest in older barrels of similar wood. 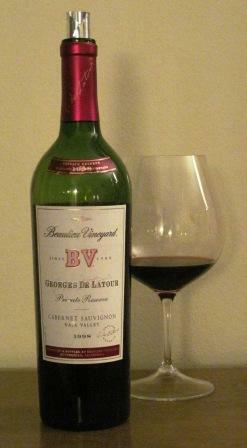 This Geyserville is among the finest of a great decade, and will be at its best over the next seven or eight years. As I said above, this bottle made it ten years with ease, and tasted as if it could have gone on for quite a while yet. It had a great nose of prunes and plums and dried funghi porcini. On the palate, it tasted and felt like a fine claret – a good third-growth Bordeaux – but more intense and bigger without losing any of the polish. A great wine: I begrudge every delicious bottle of it that I’ve drunk before this last one. Wines like this are why I cellar wine in the first place. If I were lucky enough to find wines of these now-long-past vintages on the market today, they would cost me far more in dollars than they originally did, and they would certainly cost me a great deal of time and effort to locate and acquire. The ease and convenience of just poking my head into my closet – excuse me: of course I mean stone-vaulted, cobwebby cellar – and choosing tonight’s wine is an inestimable value to a lazy curmudgeon like myself.